Bandit is a red and white parti-color with big bones and a big heart. Bandit is very laid-back and loves EVERYONE he meets. He is a polite boy — not pushy, nor demanding nor over-exuberant. He is a good-sized dog — about 65 pounds. His parents are not nearly as big, so he frequently sires an assortment of both big (like him) and smaller (like his parents) puppies. In Bandit’s litters it is not unusual to see some puppies maturing at 36 pounds and some maturing at 55 pounds in the same litter. Bandit has passed all of his preliminary genetic tests. Yankee is a deep red male, happy-go-lucky and playful little mini doodle from Nilla and Robbie. He has beautiful deep color and a happy, tolerant and expressive personality. We are planning litters sired by him spring of 2019 and will post all of his OFA, CERF and DNA clearances as soon as they are all in — I’m expecting everything to be completed and documented by February, 2019. Augie is a beautiful white and red parti-color. In addition to his striking and unusual color — he is a sweet, attentive, and affectionate little boy. Less active and energetic than our other mini doodle stud, Yankee, Augie — when combined with our quieter girls — will produce colorful, beautiful, affectionate and quieter miniature goldendoodles. They should still have the energy for playtime with the kids, but potentially will be more suitable for older folks and families with timid or very young children. We are planning to offer puppies sired by Augie in the spring of 2019. We will post his OFA, CERF, and DNA clearances as soon as we have them all in. I expect them to be finished and documented by February, 2019. Flyer is the sweet, tiny red son of our Rusty and Cameo (both retired). Weighing in at about 4.5 pounds you would think he was frail and needy — quite the opposite! He may be little but he is a robust, healthy, super-affectionate little boy. He loves everyone he meets and is also quite curious and friendly with even the biggest dogs he has been exposed to. His size makes him vulnerable — so he’s not allowed to meet many big dogs — He would be a snack if they chose so! Flyer carries Rusty’s deep red color. We will be doing more genetic testing on him to see if he also carries Cameo’s abstract color patterns. So far, all the orthopedic tests and DNA have been favorable but done only to insure health. Soon we should also know what colors he will be able to pass on. As soon as we see the results from those tests we will offer him as a stud. In the meantime, he’ll have to be content with just our girls. Robbie is a very correct red and white miniature poodle with a wonderful temperament and superior conformation. We are very happy to have Robbie as one of our stud dogs. He has passed all of his genetic tests. Robbie is one of our most popular stud dogs. He produced beautiful, colorful and desirable puppies when bred to golden retrievers, old English sheepdogs, Australian shepherds and — his most popular — Bernese Mountain dogs. Robbie adds sweet-nature and outstanding color to any litter he sires. At left: Handsome “Houston” as a young puppy. At right: At 4 months of age with his owner, Richard. Houston is a beautiful red standard poodle belonging to Dr. Richard Wheeler, the Board Certified Specialist and professor of reproduction from Colorado State University Veterinary Teaching Hospital. Houston is from a hunting/working line of standard poodles on the west coast but is also gorgeous enough to have achieved a puppy championship from an International show. Houston is the total package, combining solid working aptitude with grace, conformation and a wonderful, tolerant, accepting personality. 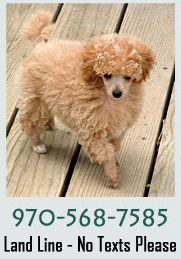 Vinny is a tall toy poodle who produces puppies much smaller than himself. Typically, 2 out of 5 Vinny puppies will mature under 7 pounds. The other puppies may be another few pounds depending on the size of the dam. Vinny is a gorgeous red sable and produces both red sable, solid apricot, apricot with white markings and phantom – patterned puppies. His puppies are typically friendly, outgoing and full of life. Vinny is very sweet and sensitive. We do not offer Vinny as a stud dog because he sufferers from performance anxiety! As long as he is paired with a little girl he knows well, he has no problem siring a litter of puppies. I guess he’s just picky!